The property at 220 Farist Road is on the market for $899,999. 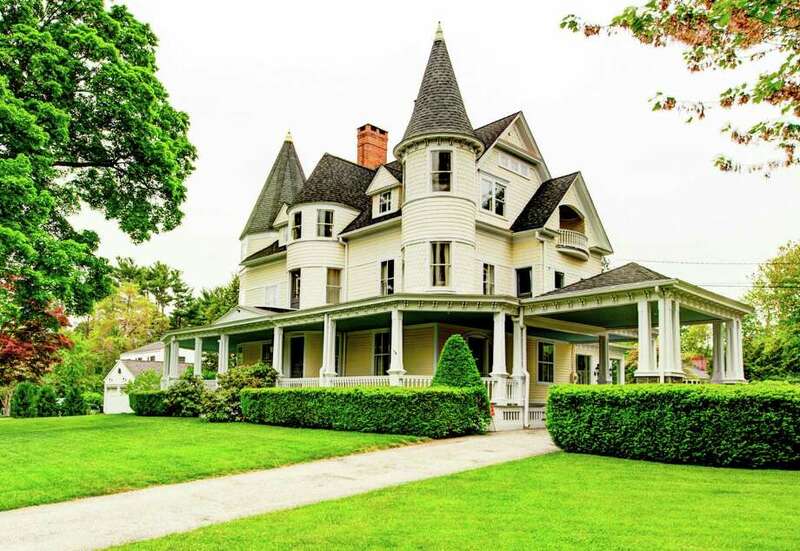 In the close-knit Fairfield Woods neighborhood, an elegant 17-room Queen Anne Victorian mansion stands out among the typical residences of later construction, and much like Queen Anne would command respect from her royal subjects so, too, does this graceful dame. The buttercream yellow, 5,152-square-foot house at 220 Farist Road was built circa 1894 and has retained its remarkable period architectural details, including grand-scale rooms, seven fireplaces — each one unique — stained-glass windows, bull’s-eye moldings and other decorative millwork, two turrets, pocket doors, original floors and an attractive staircase with notable newel posts. One room features a late 19th century safe that is more decorative than functional these days, but it is quite beautiful with its hand-painted scenes of birds and flowers on its doors. Yet the house was updated for today’s lifestyle and is completely comfortable and livable by today’s standards. It includes a flexible layout with a circular flow on the first and second floors, ceilings of at least nine feet, mudroom, large laundry room and a substantial kitchen renovation with a price tag of about $65,000. According to the document, “He displayed notable power in managing men and maintaining harmony among them. They recognized that he was ever considerable of their interests and rights and this attitude awakened their loyalty and regard … Throughout his entire career he stood as a man among men, honored and respected by all,” much like his house is respected today for its historical construction, elegant appearance and notable amenities. The house has a 1,900-square-foot, wide wrap around porch and a porte cochere. On its more than a half-acre parcel there is a semi-circular driveway and a large circular cutting garden, which includes hydrangeas, roses, phlox and other colorful perennials. Inside, every fireplace is different, each one with a different marble or decorative tiled surrounds, mantles and hearths. The paneled library has the one working fireplace. On the second floor there is a long, open balcony that can be accessed from several rooms. The master bedroom suite has one of the fireplaces. It also has his-and-hers closets. On the third floor there is a large, flexible set of rooms that could serve as a family or media room and more, or as an au pair or in-law suite. It has a kitchen, bedroom and full bath. This house is conveniently located within walking distance to schools, stores and restaurants. For more information or to set up an appointment to see the house, contact Kate Cacciatore of William Pitt Sotheby’s International Realty, at 917-952-1195 or kcacciatore@wpsir.com.